Diabetes is a common chronic disease characterized by hyperglycemia and other metabolic abnormalities. In children and adolescent,s one variant of the disease is common: the type 1 diabetes mellitus or juvenile diabetes. The disease accounts for 10 % of all diabetes cases. It may present at any age, but the mean age of presentation is 7–15 years. More than half of the patients with type 1 diabetes are younger than 20 years. However, a quarter of these patients are adults. The incidence of juvenile diabetes is thought to be rising at a rate of 3–10 % in the world with Australia and Middle East recording the highest rates of rise. Its incidence increases as you move away from the equator with 37–45 cases per 100000 children being reported in Finland and Sardinia. It has a slight male predilection. It is a genetic disease and children born of parents with type 1 diabetes have a 30 % chance of developing juvenile diabetes. Diabetes type one is a genetic disease that enjoys influence from environmental factors such as viral infections, immunizations, psychological stress, dietary influence such as exposure to allergen containing cow milk and perinatal factors that increase the risk of developing type 1 diabetes. Dizygotic twins have a 5 % concordant rate which rises to 50 % in monozygotic twins. Other rare causes of the disease include congenital absence of pancreases or removal during surgery and syndromes that occur in association with a compromised pancreatic function such as Wolfram syndrome that is characterized by diabetes, optic atrophy, and deafness. The main defect seen in the disease is pancreatic cell destruction from autoimmune antibodies that target the islet β-cells which secrete insulin. Genetic mutations in the MHC genes (DR4-DQ8 or DR3-DQ2) that confer a susceptibility of up to 4 % of developing an autoimmune reaction to the islet cells and with environmental influence on such children, the risk rises to 50 %. Viral infections such as coxsackie B3 and B4, CMV, Mumps and Rubella trigger an autoimmune reaction due to antigenic mimicry between PC2 protein of coxsackie and GAD 65 found in the pancreatic cells. Similarly weaning infants on cow milk triggers a similar reaction due to molecular mimicry between amino acids in the milk and islet cell antigen 69 in the pancreas. Cytotoxic drugs such as pentamidine and vacor cause direct toxicity to the pancreatic islet cells. Initially, the damage is minimal and it is not clinically evident. The pancreas responds by regenerating new islet cells and there is a reduced need for insulin, a stage known as ‘honeymoon phase’. However, a damage of greater than 80 % is manifested as the signs and symptoms of juvenile diabetes. The destruction could take as little as 3 years in young children or up to 10 years in adolescents. Insulin is important in the regulation of plasma glucose levels and depletion in the level of insulin triggers the conversion of stored glycogen into glucose causing hyperglycemia. Loss of glucose in urine and the inability of the cells to utilize the glucose due to insulin deficiency causes a state of starvation in the body. When the body detects this depletion in glucose levels, hormonal compensatory mechanisms are thus triggered and increase the catabolism by accelerating lipolysis and lipogenesis. There is an increase in plasma concentration of free fatty acids, lipids, and triglycerides. They are readily converted into ketone bodies such as acetoacetate and β-hydroxybutyrate that cause ketoacidosis and ketonuria. Respiratory compensation to combat the metabolic acidosis sets in and the patient begins to take deep rapid breathes. The breath has a characteristic acetone smell due to a non-enzymatic conversion of acetoacetate to acetone. With the respiratory compromise, hypovolemia due to osmotic diuresis, and plasmatic hyperglycemia, the brain has a compromised perfusion and patients may become comatose or even die. The body’s effort to get rid of hyperglycemia without acidosis causes polyuria, polydipsia, and weight loss despite an increase in appetite (polyphagia). Polyuria occurs when serum glucose concentration exceeds the renal threshold for glucose loss via the urine. The body responds by increasing the urinary glucose excretion by increasing both concentrations of the urine and frequency of urination. Polyuria may present as nocturia, enuresis, or daytime incontinence in a previously continent child. In children who are not toilet trained, parents may note an increased frequency of wet diapers and/or diapers that are unusually wet. Increased serum osmolality from hyperglycemia and hypovolemia leads to a demand for more fluid intake (polydipsia). Increased catabolism of stored glucose due to insulin deficiency gives the body an impression of low glucose supply, therefore, there is increased intake. However, there is increased fat breakdown and loss of glucose in urine thus the result is weight loss. This is known as polyphagia. Some children will be diagnosed with type 1 diabetes before the onset of clinical symptoms during routine screening especially if the clinician has a high index of suspicion, say children who have another close family member with type 1 diabetes. Hyperglycemia lowers the child’s immunity rendering him / her susceptible to infection. Presence of glucose in urine favors the growth of microbes and thus candidiasis is a common presentation especially among adolescent girls. Alterations in the osmotic milieu of the lens leads to the imbalance of the aqueous and vitreous humors flow leading to changes in refractive index and visual disturbances. Children with longstanding hyperglycemia may present with cataracts due to hardening of the lens. Signs and symptoms of diabetes such as polyuria, polydipsia, and poor weight gain with normal or minimally altered feeding pattern. Random blood sugar level equal to or greater than 200 mg/dL (11.1 mmol/L). Fasting blood sugar level equal to or greater than 126 mg/dL (7.0 mmol/L). A fasting blood sugar level is obtained after a period of 8 hours with no caloric intake and a level of 100–125 mg/dL (5.6–6.9 mmol/L) is considered prediabetes and repeat screening should be done. Glycated hemoglobin (A1C) greater or equal to 6.5 % indicates a persistent high level of glucose for the past two or three months and may be used to make a diagnosis of diabetes. Once a diagnosis of diabetes is made, other tests are done to differentiate the various types of diabetes. Urinalysis for ketones which are more common in type I diabetes. Renal function tests to rule out renal failure and obtain a baseline state prior to initiation of treatment. Oral glucose tolerance test to differentiate type I diabetes from MODY and hyperglycemia due to other medical conditions. Blood gas analysis to determine and treat metabolic acidosis. More common in the older and obese population. Due to the polyuria and thirst. Differentiated of presence of ketones or high sustained glucose level with no other identifiable cause of the thirst. Similar presentation and seen in a similar population. MODY patients respond to intake of oral medication. The disease is ruled out by identification of another disease causing the hypoglycemia. Resolves after treatment of the disease. Such as congenital absence of the pancreas. 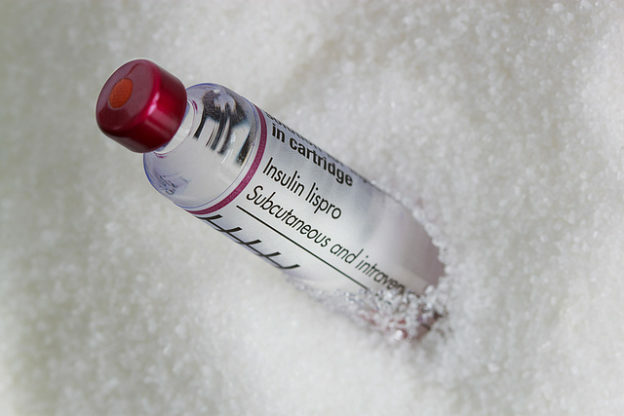 The most important intervention in the management of juvenile diabetes is insulin therapy since the patients cannot make insulin for their bodies. Diabetic education and counseling of the adolescent and of the mother to ensure adherence to insulin and to avoid psychological effects of the behavioral change. Dietary modifications and intake of food with low fat but high fiber content. Regular exercises to trigger weight loss and avoid development of insulin resistance. Regular glucose monitoring to detect onset of complications and enhance early intervention. Pancreatic transplantation: replacement of the dysfunctional pancreas restores the endogenous source of insulin. Islet cell transplantation: group of islet cells are taken from a functional pancreas and transplanted on the dysfunctional one. Stem cell transplantation: early diagnosis of juvenile diabetes prior to destruction of the pancreatic cells can be treated with stem cell transplantation from one’s own stem cells that halt the autoimmune reaction to the pancreatic cells. Vaccination against development of antibodies such as glutamate decarboxylase (GAD). Complications of diabetes can be divided into short-term complications and long-term complications. It occurs when blood sugar falls below the lower limit of normal, thus, the body lacks the energy to perform various functions. It manifests as an increased sympathetic activity due to hormone secretion with sweating, lightheadedness, fatigue, blurred vision, rapid heartbeat, irritability, and irregular heartbeat. Common causes of hypoglycemia include the erratic use of higher doses of insulin, poor oral intake or other processes that reduce the body’s glucose or its demand for insulin. Intake of a fast-acting carbohydrate such as glucose, fruit juice or candy (15 g) treats the hypoglycemia. It occurs when blood sugar rises to extreme levels but ketoacidosis has not yet set in. This occurs due to the administration of low doses of insulin or infection that could raise the demand of insulin within the body. Common manifestations include increased urination, thirst, fatigue, and difficulty in concentration. Revision of insulin dose is needed in most of the cases. A hyperosmolar hyperglycemic state is more commonly seen in adults and the elderly. Cellular starvation of energy leads to lipolysis and conversion into ketone bodies that cause nausea, vomiting, abdominal pain and fruity smell of acetone. Inpatient management with vigorous fluid infusion and insulin administration is required. The condition is associated with a high mortality due to cerebral edema especially if sodium bicarbonate was used in treatment. It is a late complication of juvenile diabetes after long periods of the disease. Constantly elevated blood sugar leads to glycation of the lens proteins. Other changes that impair vision are the damage of the small vessels that supply the retina and revascularization with new weaker vessels that rupture easily to form hemorrhages. It occurs due to damage of the kidney microvasculature by the elevated blood glucose levels. There is glycation of the proteins leading to glomerular basement membrane thickening that leads to hypertension and further damage to the kidneys. Damage to the small arteries that supply peripheral nerves leads to reduced sensation and damage to these nerves. The loss of sensation predisposes the patients to skin injury that turns into wounds that rarely heal due to high blood sugar that supports microbial growth. Recent literature has shown that peripheral neuropathy in type 1 diabetes might be also the result of the toxicity of the end products of glycation due to hyperglycemia. The effects of hyperglycemia on the central nervous system include impaired blood-brain-barrier permeability and impaired function of the visual cortical pathways. This can result in impairments in color vision and contrast detection long before the development of the first signs of diabetic retinopathy. Hypoglycemic episodes, which are more common in type 1 diabetes, also have an adverse effect on higher cortical functions. Recent studies show a correlation between the rate and severity of hypoglycemic episodes and the onset of mild cognitive impairment. Type I diabetes is a chronic disease that is well managed by administration of insulin for life. The disease, however, if not properly managed raises the body’s demand for insulin to very high levels that predispose the body to development of complications, shortening a person’s lifestyle by about 10 years compared to a normal person. Children diagnosed with the disease have an altered growth pattern, though they eventually attain the recommended height and weight for age at a delayed time. Levitsky, L. L., Wolfsdorf, J. L., & Hoppin, A. G. (2011, Oct). “Epidemiology, presentation, and diagnosis of type 1 diabetes mellitus in children and adolescents.” UpTodate.